“yum history” feature of yum is a mostly overlooked but very powerful utility in Linux. It can be used to rollback/redo/undo yum transaction to a state where everything was working fine. 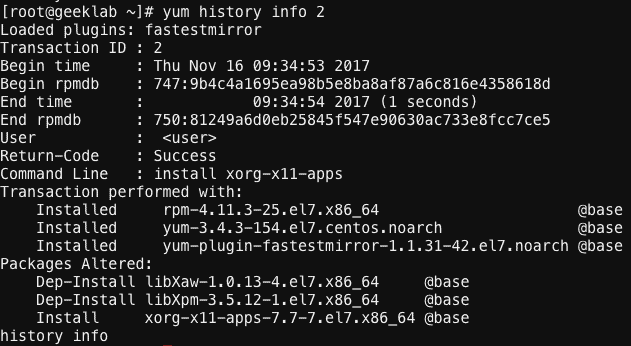 “yum history list” command when run without any arguments produces output similar to shown below. “yum history” or “yum history list” by default shows last 20 yum transactions. ID: Uniquely identifies a yum transaction. Date and time: Date and time of transaction. Action(s): Action performed in the transaction like Install, update etc. Detail list is given below. Downgrade D At least one package has been downgraded to an older version. Erase E At least one package has been removed. Install I At least one new package has been installed. Obsoleting O At least one package has been marked as obsolete. 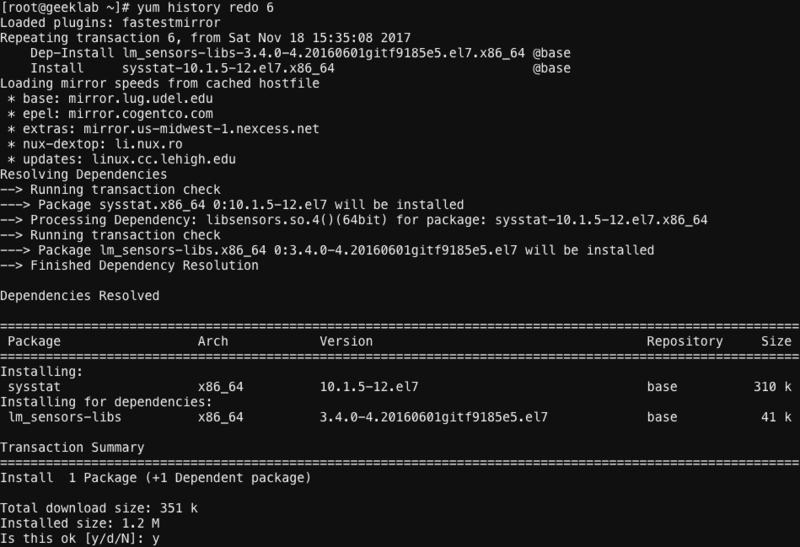 Reinstall R At least one package has been reinstalled. Update U At least one package has been updated to a newer version. Altered: Number of packages that were affected by a transaction and additional information like whether rpmdb database was changed before are after transaction etc. Detail list is given below. < Before the transaction finished, the rpmdb database was changed outside Yum. > After the transaction finished, the rpmdb database was changed outside Yum. * The transaction failed to finish. # The transaction finished successfully, but yum returned a non-zero exit code. E The transaction finished successfully, but an error or a warning was displayed. P The transaction finished successfully, but problems already existed in the rpmdb database. s The transaction finished successfully, but the –skip-broken command-line option was used and certain packages were skipped. To display all transactions, use the all option. If you know the transaction ID of a yum transaction, you can get a detailed view on it using the below command. The above command will show all the transaction like install, update, removal of the package vsftpd. We will redo the removed sysstat package removal using the command shown in the figure below. 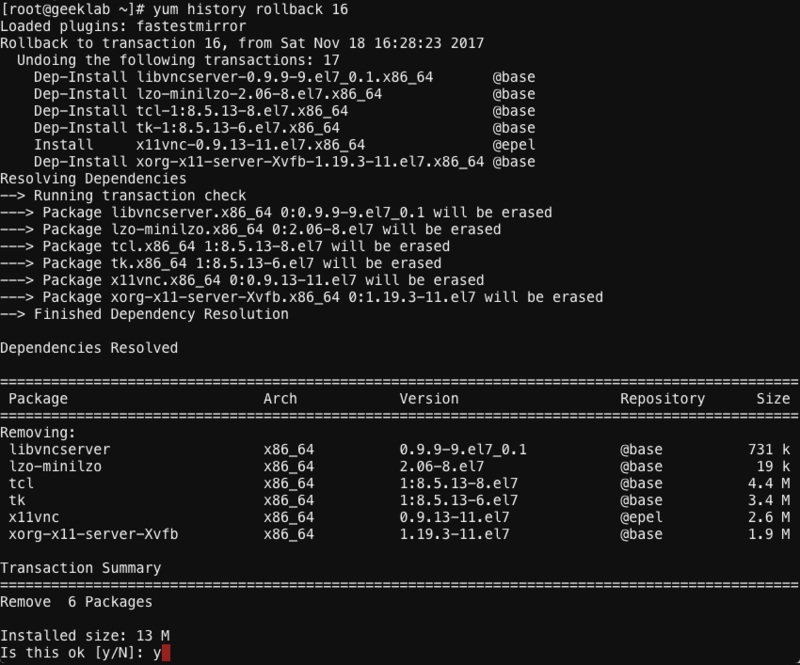 force-reinstall – reinstalls any packages that were installed in that transaction (via yum install, upgrade or downgrade). 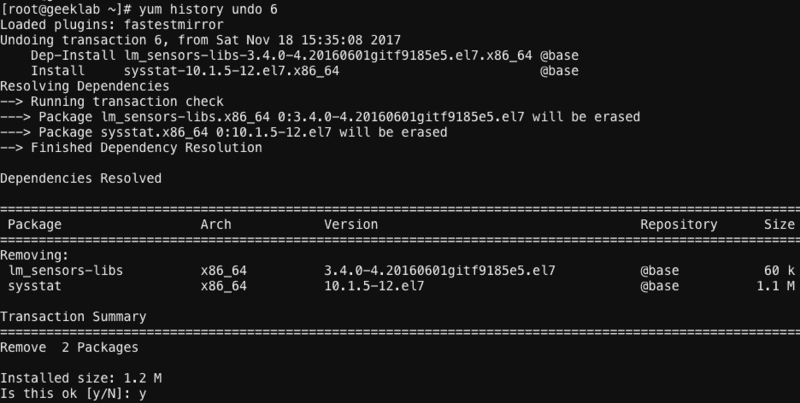 force-remove – removes any packages that were updated or downgraded.